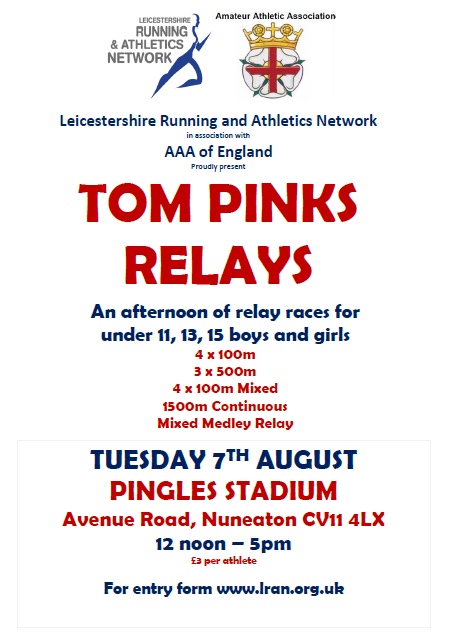 LRAN and the the AAA of England are proud to present The Tom Pinks Relays. The event will be held on Tuesday August 7th at the Pingles Stadium in Nuneaton 12noon to 5pm. The afternoon will comprise of relays for age groups u11/u13/u15. There will be heats and finals with medals for the wining teams being presented by AAA of England. “In 2007 the AAA (Amateur Athletic Association) received a generous bequest from the late Alice and Lewis Pink, to fund children’s activities in memory of their son who was tragically killed in an accident in the early 1970’s. After discussions with the Pink family, the AAA agreed to use the money to fund a series of children’s events in support of and leading up to the 2012 Olympic Games in London and beyond. This funding has now all gone however the Tom Pinks relays remain as a continuing legacy . Regrettably, the chip timing company suffered an equipment failure and no chip times were recorded. Any corrections or queries to Glyn Parker.